In a previous post I reviewed the Google Maps app for Android and iPhone, and lamented that the brilliant Android-exclusive ‘3D view’ was not yet available for London. 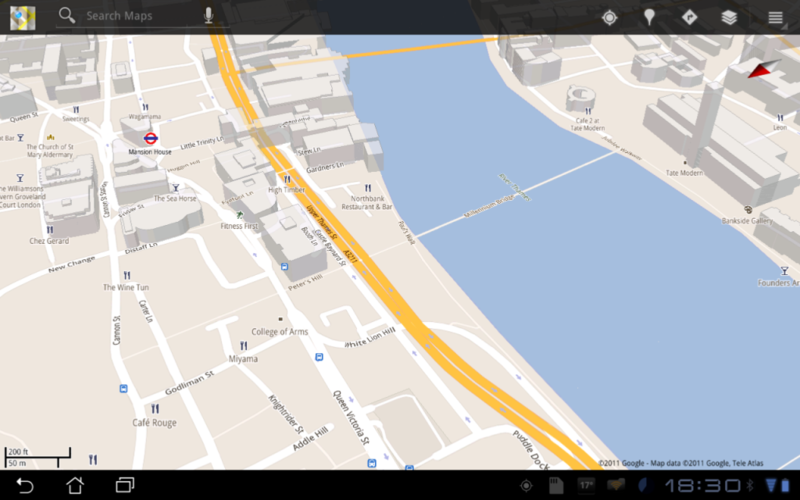 In the last few days however, my London Google map app has suddenly sprung into 3D. Watching all the London landmarks pop up on the map, in pretty accurate renditions, is still a very enjoyable novelty. The map below shows Trafalgar square at the centre, and it’s a really good representation. So far it actually seems to be useful – you get a far better picture of where things are, and how far you have to go in the 3D version. The angle of view can be altered from vertical to about 5 degrees by a (non-rude) two fingered gesture, and you can rotate the whole map by twisting your fingers. 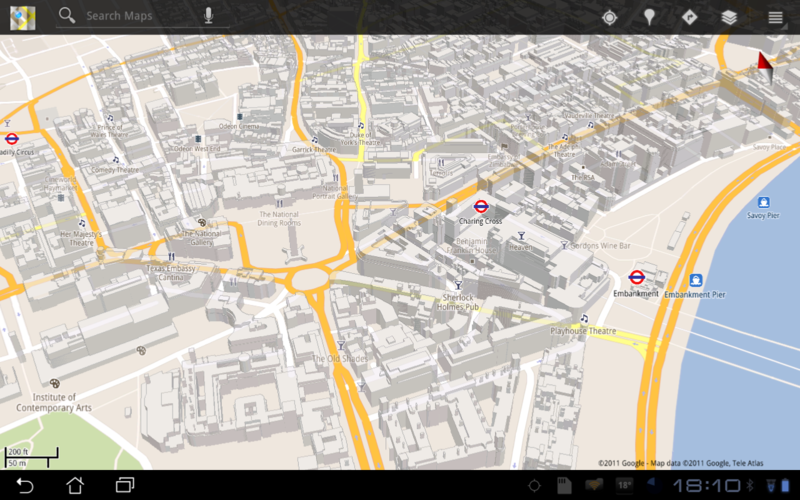 So it’s possible to float all over London in a 3D view. This actually reveals that the map is something of a work in progress. The shot below shows the Tate Modern (not a difficult 3D image to create) on the upper right, but St Paul’s is completely absent from the lower left, presumably because it’s more difficult to model. Similarly, the South Bank complex is shown very nicely, but all buildings to the west including the listed IBM building, are missing. Presumably these will get added in in due course. At this moment, tiny Google artists are no doubt busy creating the images that will soon spring up on our phones and tablets. Anyhow, it’s a great enhancement.